Who else gets ridiculously excited about Cinco de Mayo and grilling weather?!?! Cinco de Mayo was always a big deal in our household, because it is my dad and uncle’s birthday. They were both born May 5th, five years apart. How unique is that? We always went out to celebrate their birthdays and oddly enough the restaurant of choice for this Bosnian family…was a Mexican restaurant. Well now that I no longer live at home, I don’t go out for Mexican food on Cinco de Mayo, but I do love to host a good ole’ fiesta. In fact this year, a couple of girlfriends and I are hosting a Not-so Cinco de Mayo Party with a guacamole-off! Since everyone claims that they have the best guacamole…Andrew decided that there should be a competition and guests at the party have to bring their guacamole A-game. There will be judging…and lots of eating. Although the man-friend believes that one can survive on avocados and guacamole alone (he is seriously addicted), I decided to experiment with some additional recipes to bring to the party. 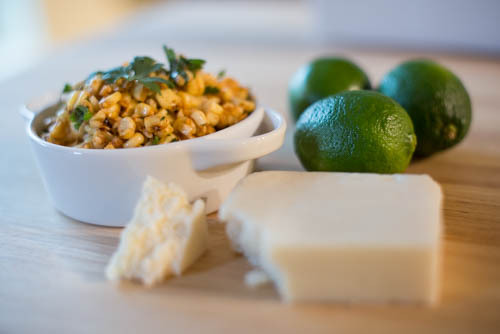 Mexican street corn is one of my favorite side dishes. You can eat it as is, throw it in some tacos, sprinkle it over a burrito bowl, add it to a salad, or dip tortilla chips in the stuff. It is simple and packed with flavor. For a large group I figured serving the corn as a salad instead of on the cob is easier (don’t worry I’ll be tripling this recipe for the party). As usual I added a healthy twist to the recipe and subbed greek yogurt for the traditional mayo. But I didn’t completely skimp on the calories…I love butter on corn so I did rub some buttery love on before I grilled it. 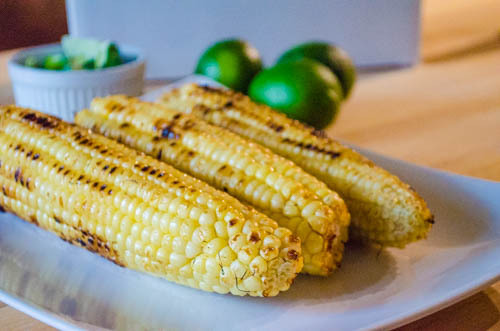 You could easily use a non-stick cooking spray if you have more self control than I do ;) The burst of the sweet grilled corn, heat from the chili powder, creaminess of the cotija cheese, and zesty lime are a combination beyond words. Added bonus…the price tag for making this recipe at home is much cheaper than ordering from a food truck or restaurant. I also want to give a huge shout out to my friend, Sean. He earned this meal since he spent 3 hours teaching me about my camera, food photography, and light room. He is even sending me some blogs about photography and letting me use his tripod. Needless to say I have a long way to go, but it’s so exciting knowing that I have so much room for growth with this blog! I promise I will share any tips I learn about taking food pictures once I am more comfortable with the technicalities. Preheat grill to 400 F. Remove husks from the corn and rinse with water. Rub corn with butter and place on grill. Cook corn for ~15 minutes, turning every few minutes, until kernels are golden-brown. Remove corn from grill and allow to cool until easily handled. Use a sharp knife to cut the kernels off the cob. Place kernels in a medium mixing bowl. Add all remaining ingredients except lime wedges to bowl and toss to combine. Adjust seasonings as needed. 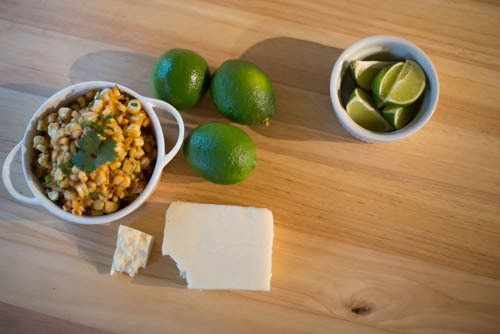 Serve corn with freshly squeezed lime juice. It also makes winter softball league even better. Oh yes, our team is officially giving the little rascals a run for their money. Let me be honest, we have a few great guys on our team, us girls…well that’s a different story. But I look forward to every Sunday, getting out and having a great time with friends. The best part of it all: grilling out and potluck before the game! My inner fat kid lives for potlucks. So many yummy treats! Wish us luck…we need it. 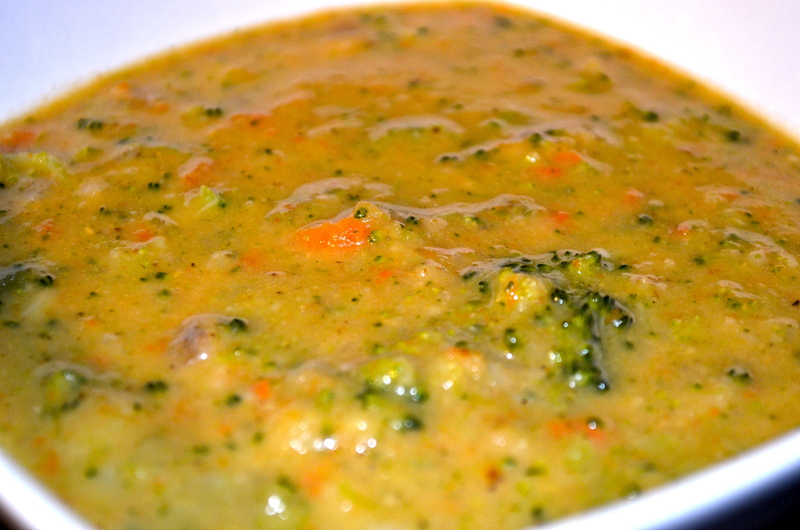 For best results, place in the refrigerator for at least 4 hours to allow dip to slightly thicken. 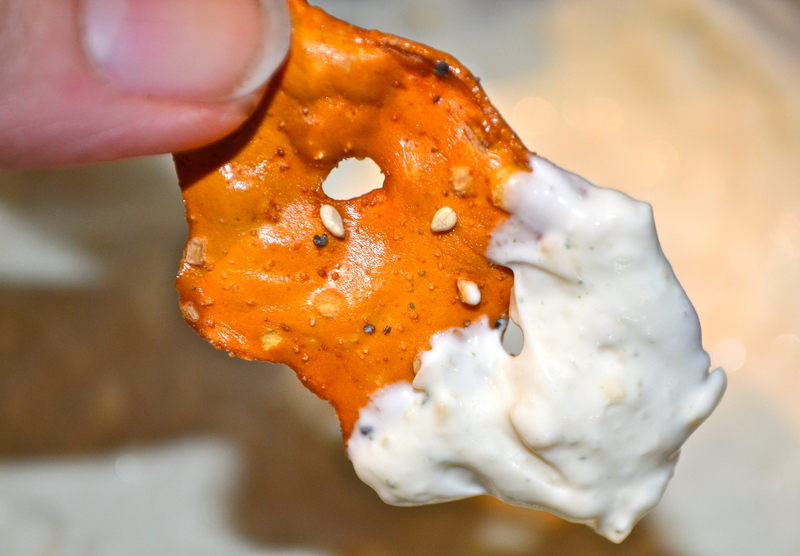 Serve with pretzels. In my opinion the best soup for a cold, rainy day is a hearty one. 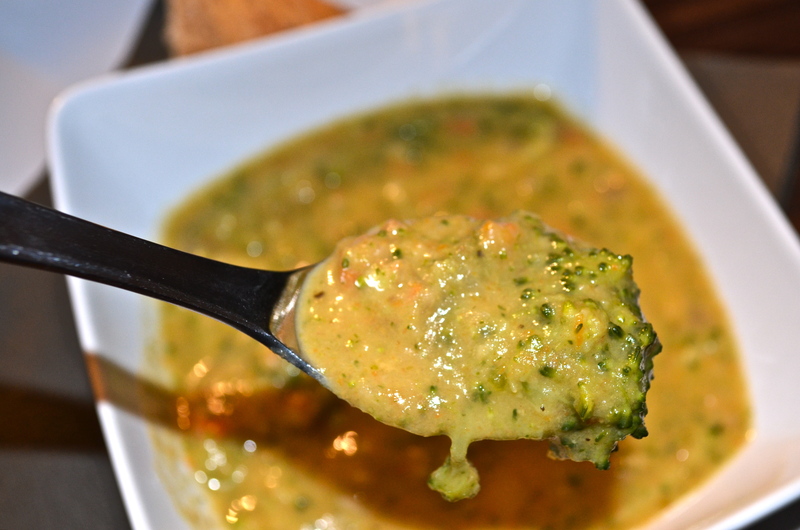 The idea for my creamy broccoli cheddar soup stems from my Nana’s love for this soup at Panera. 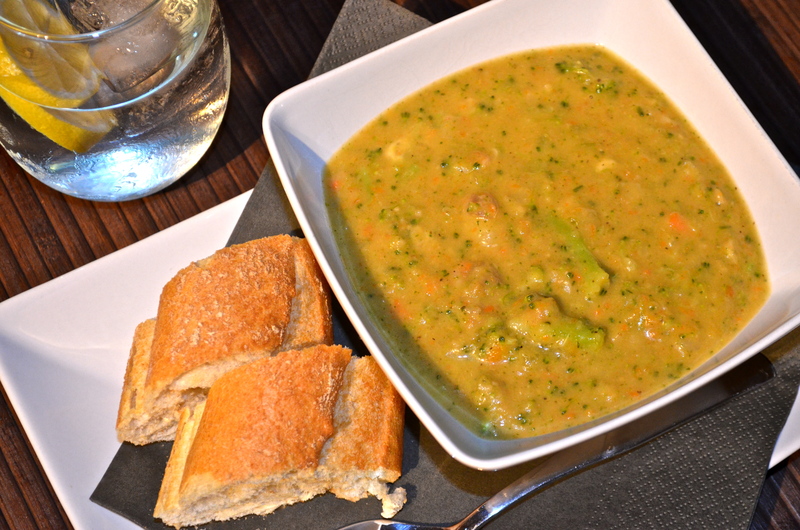 Every time that any of us grand-kids come home from college, my grandmother tells us to pick a day to go to Panera and without fail Nana always orders a bowl of broccoli cheddar soup with a whole-wheat baguette. Some of my favorite memories with Nana include these lunch outings–catching up with her while enjoying a casual meal. This is one of the few times Nana will relax and not fuss. Look at how pretty those veggies look! 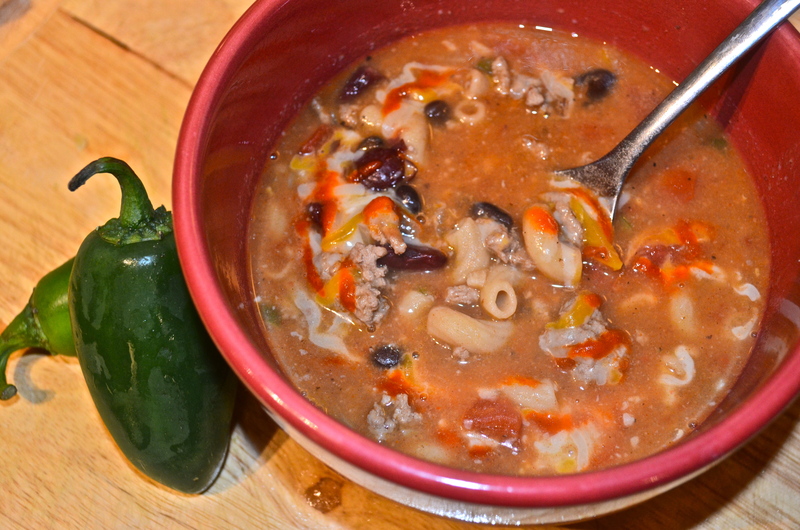 Moving to Seattle, I knew that there would be plenty of these chilly days for soups and stews and re-creating this favorite of Nana’s was one of the first recipes I wanted to tackle. I decided I would attempt to make it as healthy as possible and load it up with yummy veggies. My boyfriend always gives me a hard time about how I am “justifying” how healthy a recipe is. His rationale–nothing that tastes this good can be that healthy… so I will leave it up to you to decide if you want to view this recipe as a healthy weeknight meal or a guilty pleasure. The fact that I spent most of my life growing up in Wisconsin, the cheese capitol of the U.S., only solidifies that the one ingredient I couldn’t skimp on is the CHEDDAR…I mean cheddar is in the title of the recipe. I added deli-style, extra-sharp cheddar slices, but you could easily add 1 and 1/2 to 2 cups of freshly-grated, extra-sharp cheddar cheese. How delicious does that bite look? In a large stock pot, over medium-high heat, melt the coconut oil. Add the carrots, parsnip, onion and garlic. Cook for 5 minutes, stirring occasionally. Sprinkle the flour over the sautéed veggies, then whisk in milk and vegetable stock. Add the potatoes and broccoli and bring soup to a boil. Replace lid and cook for ~10 minutes, until potatoes are fork-tender. Turn off the heat and remove pot from the burner. Add the cheese to the pureed soup and whisk to combine. 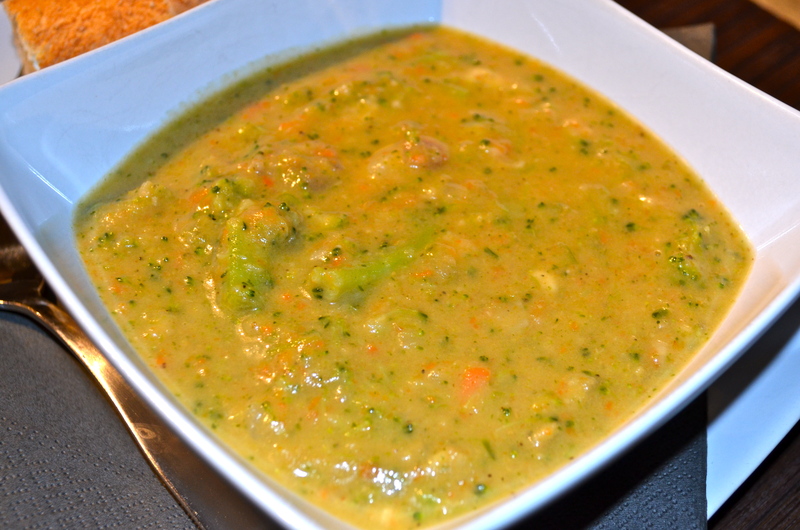 Combine the soup-veggie mixture that was set aside with the pureed, cheesy soup base. Stir gently to combine. Season with salt and pepper to taste and serve warm. Okay this is an “everything but the kitchen sink” recipe. Whenever I am leaving town for a while I think of a new creative way to use up all the produce that could go bad. I grew up in a family that was very mindful of wasting food–so no morsel is left behind or left to rot while we are out of town. 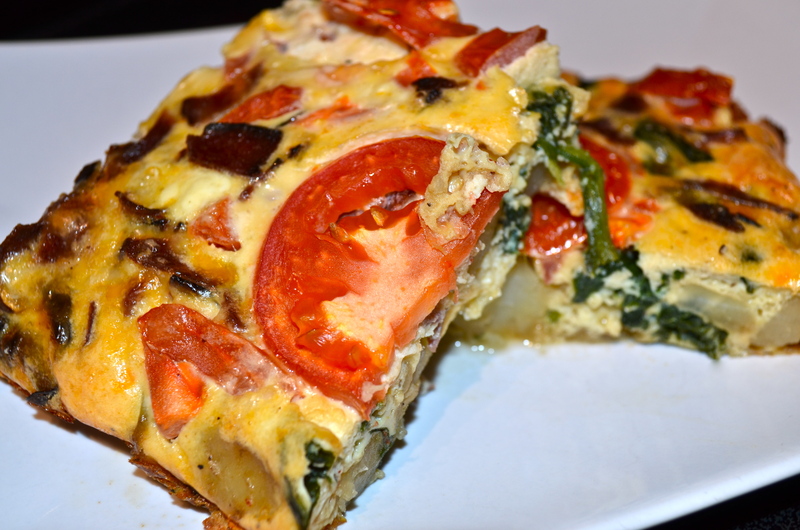 A quiche is a great way to throw veggies, meat, eggs, milk/cream and cheese together. I feel that quiche is more than a brunch kind of meal. It is hearty enough to be enjoyed for breakfast, lunch, and dinner. 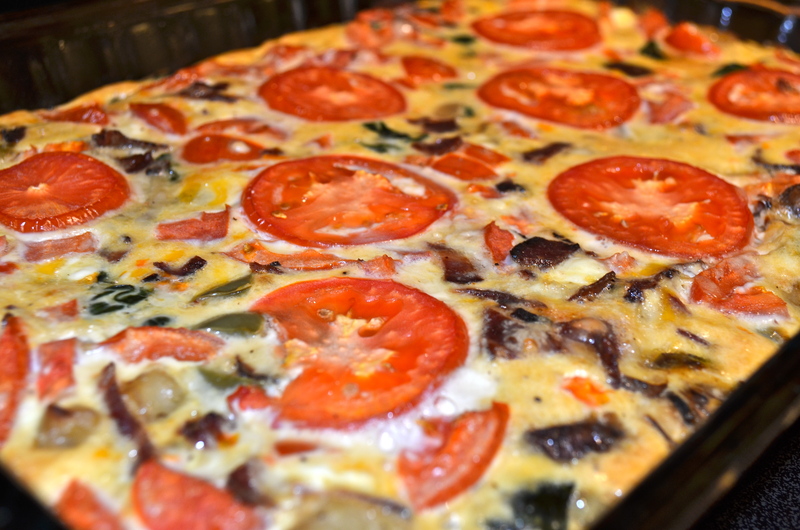 Which is just what we did tonight–quiche me baby! Too far?? I hope not. 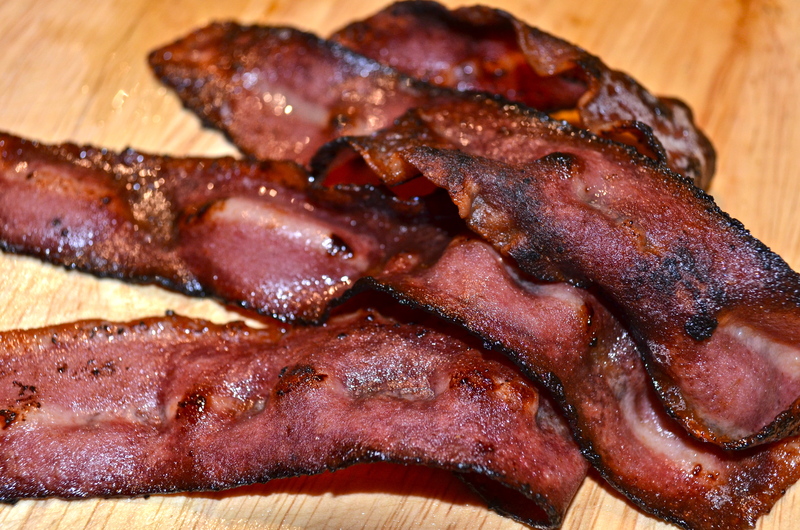 Because why wouldn’t I take pictures of glorious bacon? I decided to make a crustless quiche to save on the carbs and fat that normally come with the buttery crust you expect. After all I am putting potatoes, cream, and cheese in this little gem so I don’t think the crust will be missed. Alternatively, I have also used phyllo dough for my quiche crusts. This is a great crust substitute, especially if you love a flaky, crunchy crust! Look at that veggie-loaded, custardy goodness. Tortilla Española translated Spanish omelet is an item found on the majority of menus in Spain. It is a traditional “tapa” or small plate. The classic tortilla española is a combination of onion, potatoes, eggs, spices, and oil. It is a fluffy omelet-like consistency. Are you putting two and two together yet? Oh yes… I decided why not combine my love for all things Spanish, especially tapas, and my love for quiche? VOILA a mediterranean tortilla española. I went with the adjective “mediterranean” since the key ingredients, other than the potatoes and eggs, were goat cheese, spinach, and tomatoes. A dollop of some home-made curry ketchup, maybe hot sauce, or even sour cream? Boom. Happy taste buds. Honestly, you can add whatever veggies, meat, or cheese you have on hand, even substitute milk for heavy cream…this is the beauty of quiche! Dare I say olé? Preheat oven to 400 F and spray 9×13 pan with non-stick cooking spray. In a medium-size skilled, over medium-high heat cook the turkey bacon according to instructions on package. While the bacon is cooking, place the the diced potato in a microwave-safe dish, add 2 T water, cover with plastic wrap and microwave for 4 minutes. This will allow the potatoes to get tender. Remove the bacon from the skillet and set aside. Add oil, onion, pepper, and mushrooms to the skillet. Cook for 3-5 minutes until the onion is translucent. 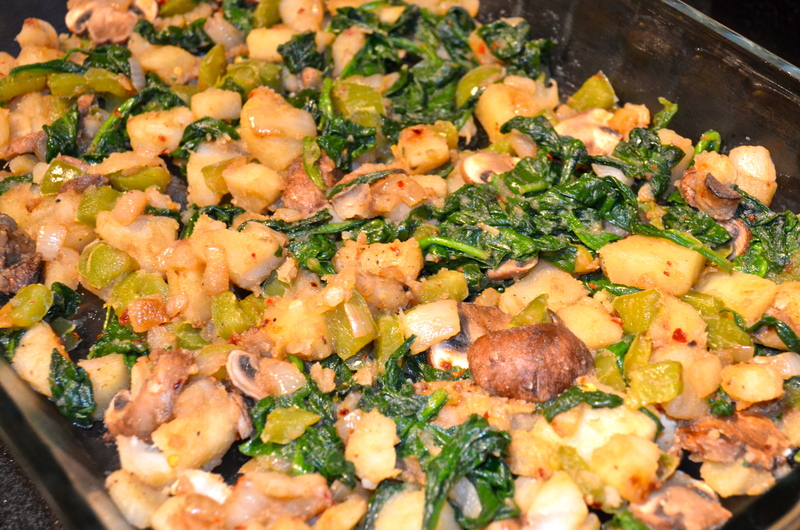 Add the microwaved diced potatoes (drain excess water) and fresh spinach to the skillet. stir and place lid on pan, cook an additional 3-5 minutes until spinach has wilted. Remove from heat and allow to cool for ~10 minutes. While the veggies are cooling, dice two of the roma tomatoes and slice the third tomato into 1/4-inch pieces. Set aside. Once the bacon has cooled, chop it into small pieces (similar in size to diced tomato and onion). Set aside. 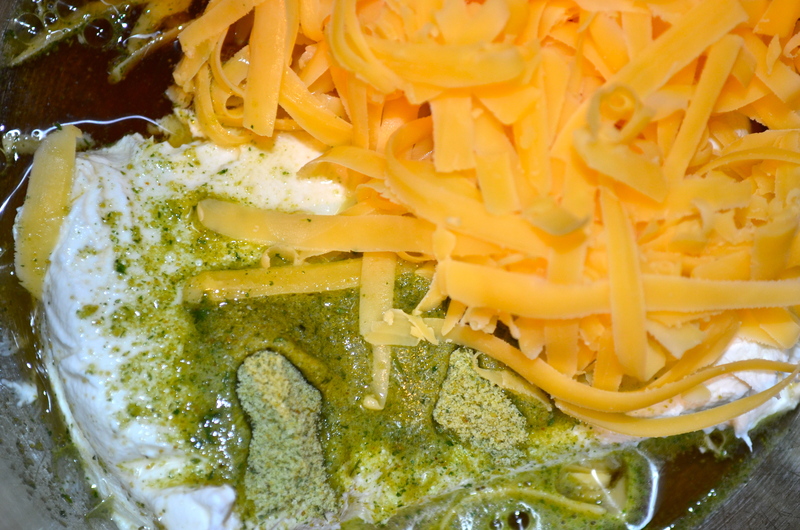 Crack the eggs into a medium-sized mixing bowl, add the egg whites and heavy cream, whisk until well-combined. Then add the diced tomatoes, shredded cheese, crumbled bacon, red pepper flakes, salt, and pepper. Whisk to combine. Spread the warm (slightly cooled) potato veggie mixture on the bottom of the pan. Then pour the egg mixture evenly on top. 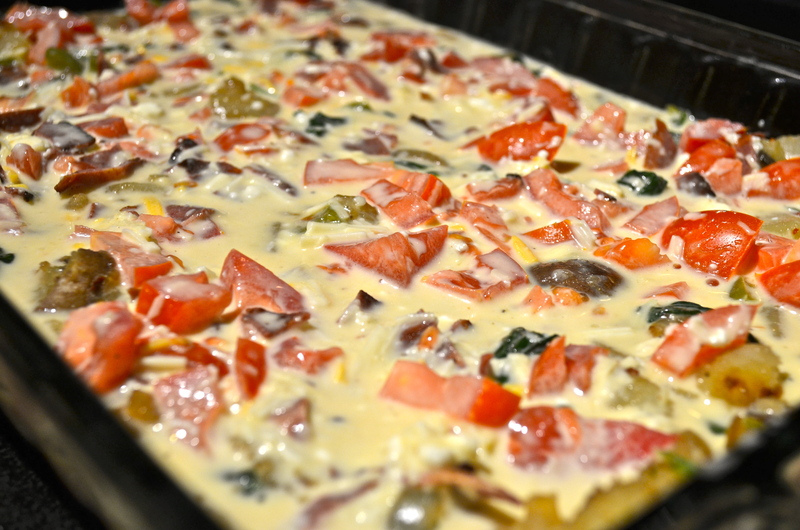 Decoratively place the remaining tomato slices on top of the egg mixture. Place in the preheated oven and reduce heat to 350 F, bake for 45 minutes. Sorry in advance for the quick blog post! We are in the midst of packing and Christmas shopping before we head to Alaska for Thanksgiving. I cannot wait to explore Anchorage and spend some quality time with Andrew’s family–they make me feel like I am home whenever I am with them (minus the sassy foreign humor of my Bosnian bunch). One of my co-workers recently requested that I feature some “one-pot” dishes. I love the simplicity, efficiency, and minimal clean-up of one-pot meals. Three of my favorite meals are chili, mac n’ cheese, and stew. All three are comfort food and perfect this time of year. 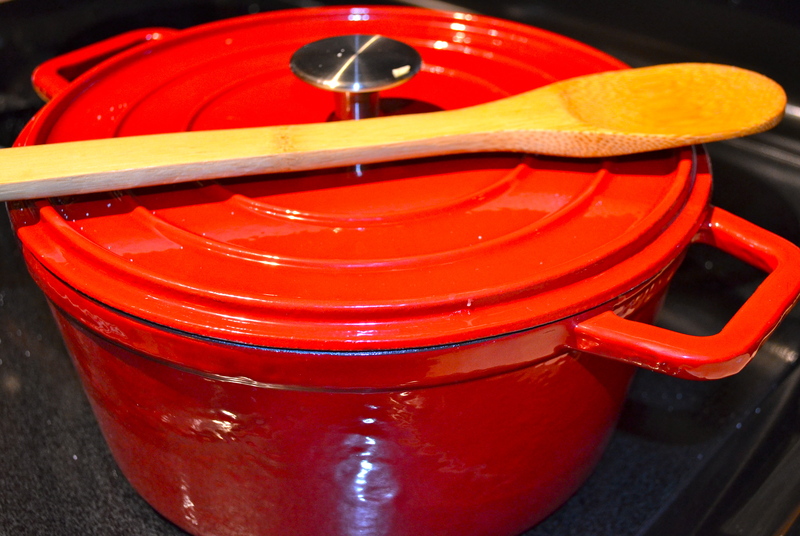 So why not make a combo of the three, throw it all in my UW Badger red dutch oven, and call it a meal? That’s exactly what I did for dinner tonight. Feel free to play around with the spices, I favor the spicier side of things so I threw in a whole jalapeno, seeds and all. 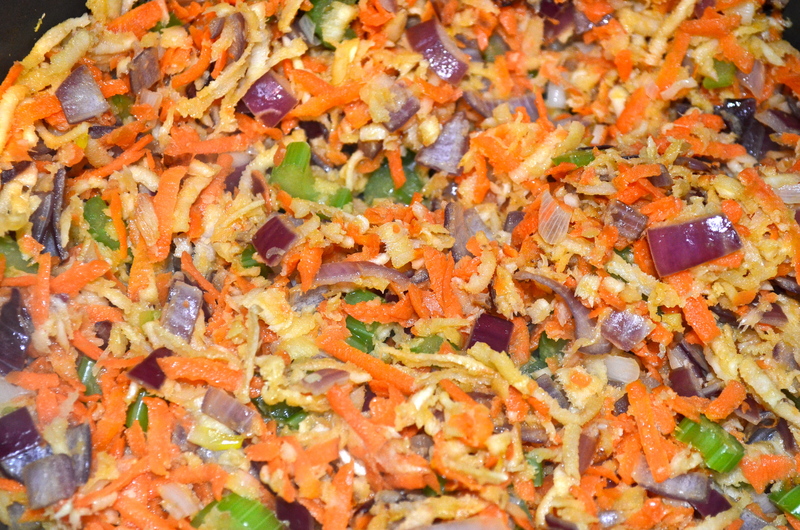 You can also substitute whatever ground meat you have on hand or even use chicken breast that you shred before serving. 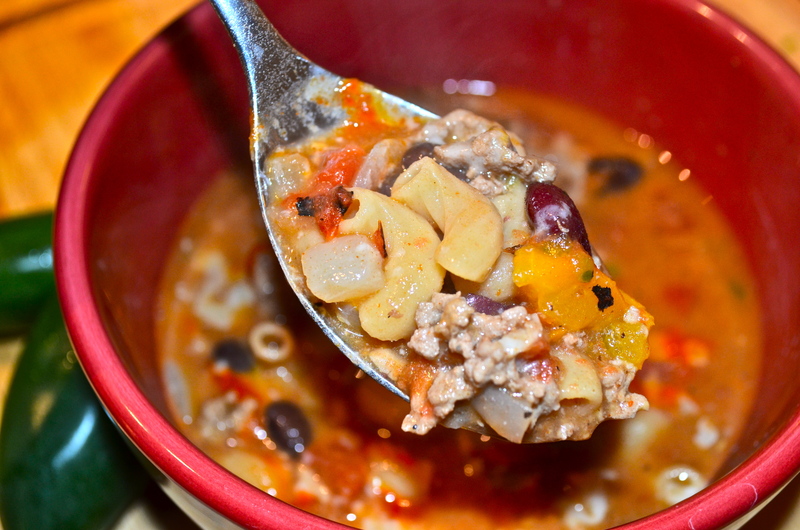 Serve up a piping hot bowl of this turkey chili mac and ease your weeknight meal worries. Heat a dutch oven over medium-high heat. Add oil, onion, pepper, jalapeno, and garlic to the pot. Cook for 2-3 minutes. Add the turkey and brown the meat, cooking an additional 3-5 minutes. 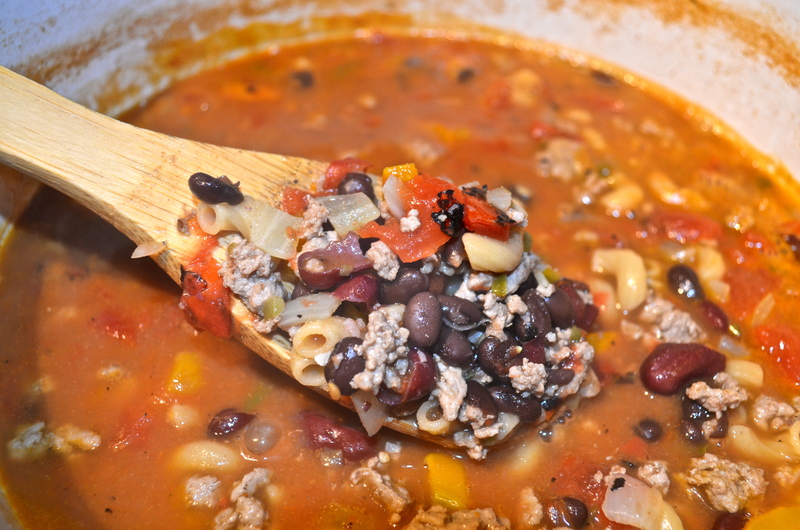 Add the beans, tomatoes, pasta, water, and spices to the pot. Bring to a boil, replace lid, and cook an additional 10-15 minutes until pasta is al dente. Remove from heat. Taste and adjust seasonings accordingly. Add the cheese to the pot and stir until well combined. 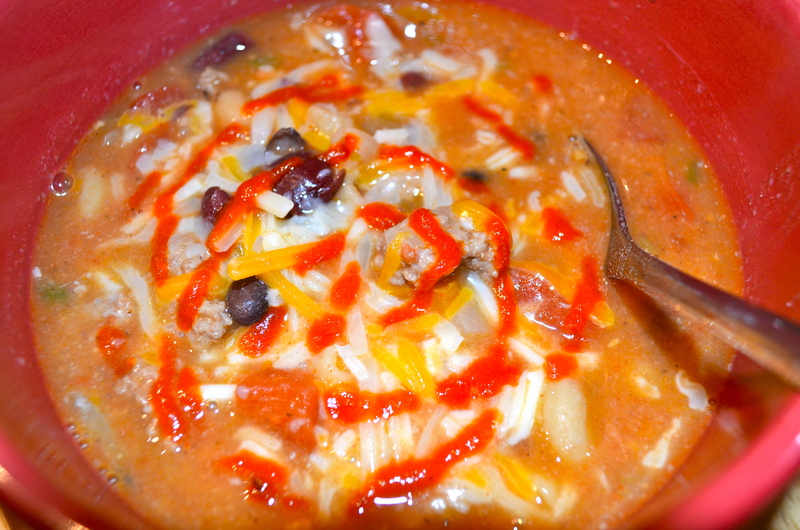 Allow to cool for 10-15 minutes and serve hot with additional cheese (and in my case Sriracha) sprinkled on top.